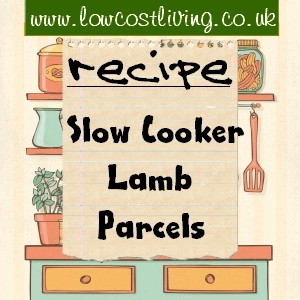 One of our favourite meats is lamb, and although this recipe is for spring lamb really is can be any age – mutton chump chops are just as delicious. It really is worth checking out your local butcher for lamb as often they have lamb at a great price if you buy a half or whole jointed (don’t forget to ask for the offal too). It does mean keeping some freezer space, but is worth the cost savings. This can be cooked in either a slow cooker or the oven, and quantities can easily be altered depending on family size. Sear the chump chops in a hot oiled pan until nicely browned on both sides and set to one side. In a saucepan heat the cream, stock, and redcurrent jelly then add the cornflour to thicken. Into each foil parcels lay the lamb chop, 1/2 onion on top, then sprinkle in 1/4 of the red peppers and mushrooms. Pour into each parcel 1/4 of the cream and redcurrent sauce, salt and pepper to taste, and a sprig of rosemary. Seal each parcel twisting the ends upwards to make sure the sauce and contents doesn’t leak out. Place in the slow cooker on high for 4 hours or medium for 6+ hours. If cooking in the over cook at 180c for 1 hour. Serves 4. This is delicious served with fresh buttered greens and garlic and rosemary roast potatoes.